Nisekoi, written and illustrated by Komi Naoshi, bears a simple concept. The story revolves around a high school boy (who ages at the series progresses) by the name of Ichijou Raku (last name, first name). Despite his yakuza background, he is otherwise an average honor student with an ambition to become a successful government worker against his family’s wishes, as they want him to inherit the title as the next head. Meanwhile, he must also deal with his struggles for love as he fondly recalls a memory from nearly a decade ago where he struck a promise with a girl, whom he has promised to marry when they reunite. To remember this promise by, the girl gave Raku a locked pendant while she herself left with the only key that has the ability to open it. However, things get complicated when Raku slightly goes against his plans by crushing on the sweet and kind Onodera Kosaki in his class… and the struggles don’t stop there. The sudden appearance and first meeting of Kirisaki Chitoge, the daughter of the chief from the Bee Hive Gang, not only goes wrong, but she ruins his plans of achieving love. What’s more, the Bee Hive Gang and the Shuuei-Clan of the yakuza are caught in turmoil, and the only way to stop a mass destruction of Japan is for the young Chitoge and Raku to date. Both groups agree that for the happiness of the two, they will cease their fighting. And thus, the title of False Love comes into effect as Chitoge and Raku pretend to be each other’s lovers. The beansprout (Raku, on the left) and the gorilla (Chitoge, on the right). The basic premise of the story is simple, but unfortunately for Raku, the girls are not. His life takes a complete 180 as he must learn how to adjust to this new setting. It becomes apparent immediately that Chitoge and Raku don’t get along due to their hot-blooded natures. Furthermore, Raku fears his fake relationship with Chitoge may detriment any chances he had with Onodera. Allow me to go over the characters in Nisekoi/False Love so you can understand then better. Raku (on the left), Onodera (in the middle) and Chitoge (on the right). Ichijou Raku, despite his yakuza background, is truly just an average high school guy. He achieves amazing grades, hopes to secure a high paying regular job and wishes to find love. However, that’s not all. From the very beginning of the manga, we see that although he is indecisive and lost with his own feelings, he is incredibly kind, selfless and constantly worries over other people’s well beings. But alas, he is nothing short of a typical harem male protagonist, which is what puts most people off. Kirisaki Chitoge is introduced as a half-Japanese half-American girl. At the beginning of the story, she has returned from her time in America and is reintegrating into Japanese society. During the story, we see that she is brash, loudmouthed, speaks before thinking and is a glutton by nature. However, despite this, Chitoge also has a soft side. She, like Raku, is also selfless, kind and caring. She acknowledges her own faults after her outbursts and often attempts to take responsibility when it calls for it. Again, like a typical harem, Chitoge is your average tsundere character. Onodera Kosaki is someone Raku has had a crush on since middle school. She is described as the perfect wife for her appealing outwardly appearances, her generally soft and welcoming nature and her overall cuteness. Often referred to as just “Onodera” by Raku, she is shown to reciprocate her feelings for him- but both of them fail to realize this and are too awkward or insecure to admit it to each other. Onodera’s best friend, Ruri, takes notice of this and constantly tries to set them up for perfect opportunities to be alone. Onodera can probably take the place of the “childhood friend” role in common harems, even though their respective crushes have only started since middle school. More characters will appear later, but you will have to find them out for yourself! Some of the side characters you will see early on are Miyamoto Ruri, who is Onodera’s best friend and wing woman. She, along with the other side character, Maiko Shuu (who is Raku’s best friend), are both incredibly insightful, aware and they only want the best for their respective friends. It should be noted that Shuu is probably more aware than Ruri, but he often makes jokes or plays along with situations that he thinks are fun (that other characters may think otherwise), so he is used for comedic relief. 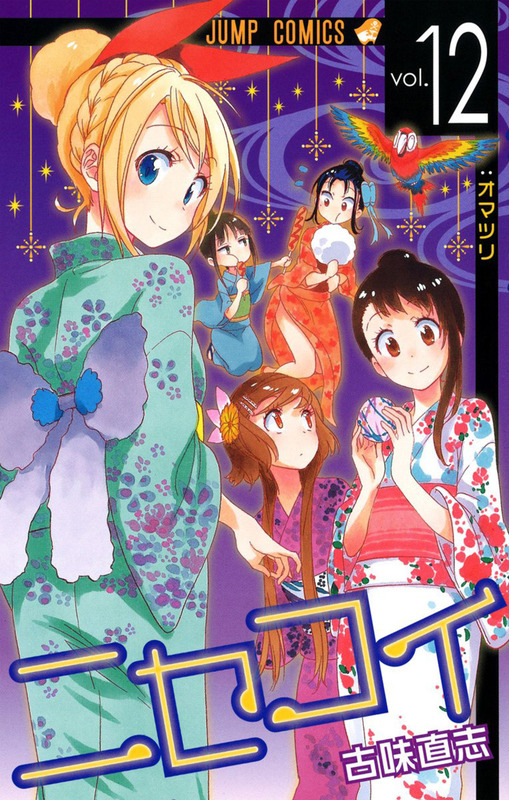 In any case, if you are looking to dive into Nisekoi/False Love, be prepared for over 200 chapters of content (many of which are filler chapters, and the ones that are NOT fillers will focus on one of the many girls involved in Raku’s harem). You will laugh, you may cry, you may board a ship that is bound to become the next Titanic- who knows? The manga is still ongoing, but rest assured, the ride may be enjoyable (if you’re into this genre) and definitely not a bad series to follow once a week (serialized in Shounen Jump). An image with some of the girls. Source. Personally, I think there are plenty of ups and downs with this manga. I particularly dislike harems and more-so the cliche harems, but for some reason, I have never felt compelled to drop this series. So even if this type of genre doesn’t quite strike your fancy, give it a try! You never know what kind of journey Nisekoi/False Love may take you on. If you’re interested in giving it a try, check it out on Amazon.co.jp! Digital copies are available, even if you do not own a Kindle. Click here to get started! And if an Amazon Gift Card is all you need, then rest assured, because we’ve got you covered as well. Click here to buy one today! Previous post: Christmas Time is Here! !